There are times when you have to be completely original. There are also times when speed and quality are more important. In such cases a high quality UI pack can make the difference and save you a lot of trouble. 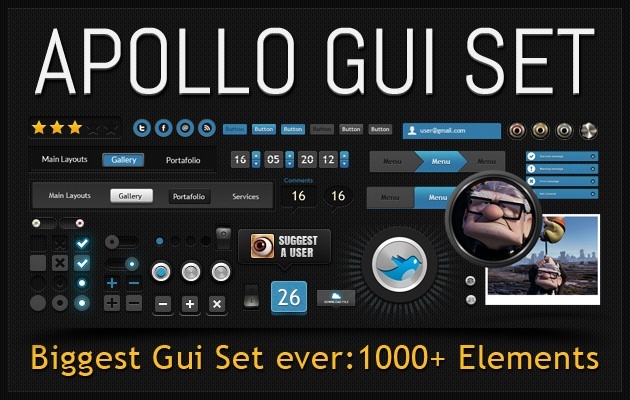 Apollo is one such UI pack, with over 1000 elements. It has multiple variants for common interface elements, font components, textures, icons and it has 30 color variants built in for quick complete changes. Plus, you can modify the PSD files yourself and create a custom UI exactly as you need it, without having to reinvent the wheel along the way. The pack is made of several modules. The first module can be downloaded and used for free (and it should be enough for most small to medium projects). For the full set you only have to pay a small price of $18 or to become a Design Shock club member (that also gives you access to all the other resources they are offering).